Cancellations to flights hascontinued at Scotland's airports as fog caused major disruption to Heathrow Airport for the third consecutive day. Just days before Christmas, the country's airports should be experiencing their busiest time with 81,000 passengers for Friday alone. About 53 flights from Glasgow, Edinburgh and Aberdeen were cancelled. 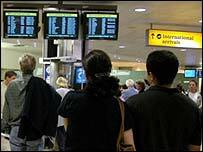 Airport operators said 18 departures were cancelled from Glasgow, 24 from Edinburgh and 11 from Aberdeen. BAA Scotland spokesman, Donald Morrison, said: "It is likely that the disruption will continue into the weekend and passengers are still advised to check the status of their flight with their airline before leaving for the airport, particularly if they are flying to London and other airports in the south." On Thursday there were 47 cancelled departures -17 from Glasgow, 20 from Edinburgh and 10 from Aberdeen. The problem began on Wednesday when dense fog led air traffic controllers to place restrictions on how many flights could take off and land at the west London airport. British Airways, Alitalia and Lufthansa are the worst affected airlines. Passengers are advised to check with their carriers before travelling to the airport. SNP leader Alex Salmond was angry Scotland was "suffering" from something which was happening in the English capital. He told BBC Radio's Good Morning Scotland programme: "This is a total outrage, fog at Heathrow, Scotland cut off - what a situation to be in. "What British Airways do as an act of company policy is cancel its domestic flights to re-enforce its international flight pattern. "It is entirely wrong because Scottish passengers pay through the nose for shuttle fares and end up being treated as second class citizens." But Brian Potter from the Scottish passenger agents association, which represents 350 travel agents in Scotland, said it would be wrong to blame BA for what was a difficult situation for everyone. He added that his members were busy dealing with cancellations and re-booking passengers where possible onto other flights and train services. Mr Potter said: "There is no magic wand when it comes to alternatives, it is a difficult time for everyone. "Unfortunately, there will be no compensation, customers will be offered a refund or offered the chance to go on another day with the same airline. So it's a full refund or waiting for new flight." It is thought at least 5,000 passengers could be affected by Friday's cancellations at Scottish airports. The day was expected to be the busiest before Christmas, with 81,000 passengers across operator BAA's three Scottish Airports - Glasgow, Edinburgh and Aberdeen. A further 213,000 travellers are expected to pass through in the lead up to Hogmanay. BAA spokesman Simon Baugh said: "I don't believe there is any airport in the world where there are 1,300 flights a day on two runways in dense fog. "Every airport would put in place these rules in dense fog, we only have two runways." Captain Mervin Granshaw, from the British Airline pilots Association, agreed that the number of runways does have an impact when problems such as fog are encountered. He said: "When the fog comes in, we do have to slow down the rate of approach so that none of the instrument landing signals are distorted by the proximity of the other aircraft. "So, instead of it being 50 movements an hour it would be 25 movements an hour. if you had another runway at Gatwick or Heathrow you could use that extra capacity and it would run much more smoothly. "This is what happens in New York, Amsterdam and Paris, but we don't have enough runways for the industry at the moment." 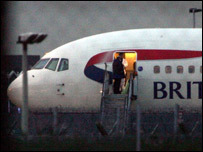 BA passengers are being urged to check the airline's website or call 0800 727 800. Train operator GNER advised people to travel off peak and keep luggage to a minimum. Low-cost bus operator Megabus has more than doubled capacity on its London to Glasgow service. Have you been affected by the delays? Are you, your friends or relatives stranded and trying to get home for Christmas? You can contact us at newsonlinescotland@bbc.co.uk.